Zucchini thrives in well-drained soil rich in organic matter. 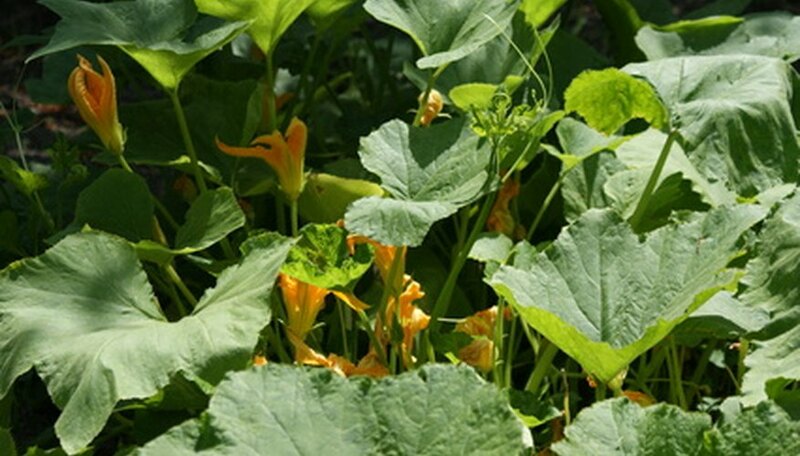 The large upright plant spreads to three feet or more but does not produce vines like winter squash. One or two plants provide a family with an abundance of fresh fruit suitable for eating right the garden, adding to salads or sautéing with herbs and tomatoes to create a savory side dish for summer meals. Excess fruit makes delightful pickles similar to cucumber pickles, and shredded fruit is the main ingredient in moist zucchini bread or cake. Select an area that receives full sun for at least six to eight hours a day. Till to a depth of 8 inches and remove any rocks or debris from the soil. Rake the area smooth. Test the soil with a home soil test kit or contact you local cooperative extension for a soil test kit. Follow the recommendations for adjusting the pH of your soil, if needed, to between 6.0 and 7.5. Add any recommended amendments to the soil to balance nutrients. Mark the planting row with the edge of a hoe. For short rows, stakes and string are unnecessary, but for rows more than 5 feet, place a garden stake in the soil at each end of the row, run garden twine between the two stakes and tie securely. Use the twine as a guideline when marking the row to keep rows straight. Add a 2 to 3 inch layer of well-rotted manure or compost over the top of the row. Work it into the soil with a hoe or rake. This improves the texture of the soil, promotes both drainage and good aeration and adds nutrients to the soil. Plant zucchini seeds in spring after the danger of frost has passed and soil temperatures remain above 60 degrees F. Sow seeds to a depth of 1 inch, spaced 2½ to 3 feet apart. Firm the soil securely with your hands or the back of the hoe. Water to moisten the soil to a depth of 2 inches and keep the soil moist until seedlings emerge in seven to 14 days, depending on the weather and soil temperature. Apply water-soluble fertilizer designed for garden vegetables following the recommended application rate when the plants are 4 inches high. Repeat on a 10- to 14-day schedule until the plants bloom and fruit sets. Water deeply once a week to moisten the soil to the root level. Zucchini may require more frequent watering during hot, dry periods and when setting fruit. Check soil often and keep slightly moist. Mulch with grass clippings if the soil dries excessively. Harvest zucchini when fruits are 4 to 6 inches long while the fruit is tender and seeds are small. Check daily for any new fruit and pick promptly. Zucchini grows rapidly, reaching sizes of 12 inches or more in a few days.